Not every music school has properly trained teachers, but at Artist Music, our faculty all have degrees in the fields they teach in. That means that you won't be taking piano lessons with a guitar teacher, or cello lessons with a violin teacher. Our instructors teach in the field that they received their degrees in, which means that you get trained the correct way, right from the beginning! "My two instruments as a child were piano and cello. Piano turned out great, but unfortunately, I was signed up for private cello lessons with a violin teacher. When I reached college and started lessons there, I discovered just how damaging that was - my position, bow hold, vibrato, and other techniques were all violin techniques that were keeping me from reaching my full potential. By that time, they were ingrained and quite difficult to change. To keep that from happening to others, we've vowed at Artist Music Academy that every student will be taught correctly from the start!" In order to make the best musical progress possible, it is important for students to have performance opportunities. 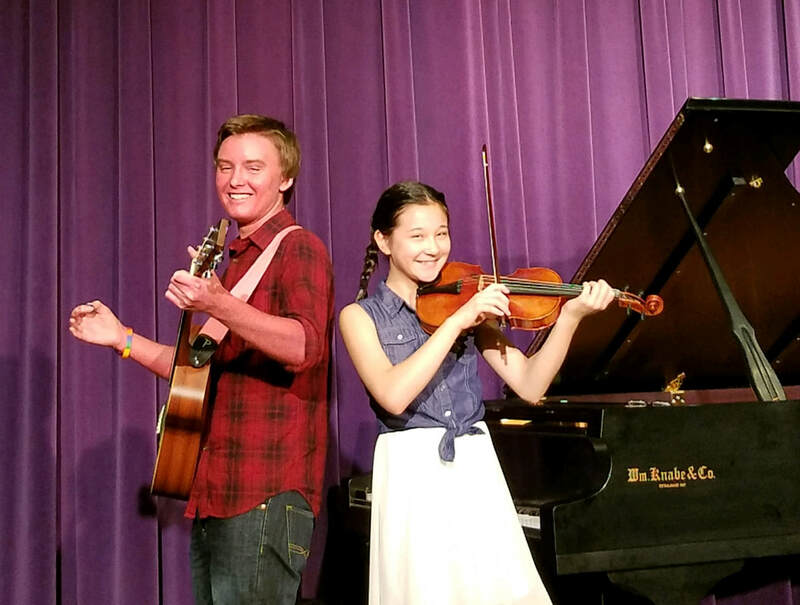 In addition two two large annual recitals, Artist Music Academy gives students a variety of opportunities to perform in public and in front of their fellow students. In addition, students at Artist Music Academy receive awards at our recitals for practice, progress, and other achievements! Many Artist Music Academy teachers are members of outside organizations that offer additional opportunities and benefits for students. Organizations like the Music Teachers Association and Trinity College of London, which have testing programs, competitions, and recitals. And organizations like the National Piano Guild, which conducts annual evaluations of registered students. "During my year of piano study at the State Music Academy in Vienna, Austria, I was told early on that I was to practice only on a grand piano. The reason is that the internal action (and therefore the tone production) is different from an upright piano, and extremely different from a digital (electric) piano. Not everyone can have a grand piano in their home, but we can make sure that students have access in their piano lessons to the full range of tonal expression offered by a grand piano." Unlike many music schools and music stores, Artist Music Academy prioritizes the comfort of the student and the general lesson experience. Our over-sized lesson rooms allow plenty of space for teacher-student interaction, and even for parents or other members of the student's family to sit in the lesson. For parents not wanting to sit in the lesson, our full French doors and/or lesson room windows allow the lessons to be observed from the hallway. If you haven't visited our facilities, be sure to stop by and see for yourself! Unlike most music stores and community music programs, Artist Music Academy requires that its regular teachers have at minimum a bachelors degree in music, and the majority of our teachers have, or are working on, a Master's degree in music or higher. Our instructors are well-qualified to teach technique and musical fundamentals correctly from the start, and work successfully with students who have developed poor technique through self-instruction or from an insufficiently trained teacher. With larger-than-average teaching rooms and grand pianos for our piano students, our facilities are designed to support our quality instruction. We also maintain membership in multiple professional organizations that give our students access to outside performance and evaluative events. And yet, we still strive to bring enjoyment to the student and are careful to select a course of study geared toward the individual’s needs.